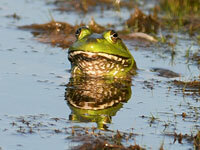 View our local nature calendar here. What's happening with our urban growth boundary, the Rural Crescent? Join us to hear the latest news. Special guests Woodbridge Supervisor Frank Principi and Brentsville Supervisor Jeanine Lawson. Green buffers are at risk - what’s up with that? Over the long run, buffers raise property values and attract economic development. But developers say they consider buffers to be "unusable space" that limits profitability. Join PWCA to hear the latest about ongoing efforts to protect green open space. Share your views, meet new friends and have fun. Free. Buy your own beer, appetizers provided. Join us for a walk along a living shoreline at Leesylvania State Park led by ecologist Charles Smith and project designer Tom Dombrowski. As sea levels rise, erosion of our Potomac River shoreline will increasingly threaten wetlands and wildlife habitats, and reduce the abundance of key bird and other species. A variety of approaches to protect these important resources are available, ranging from hard fixes to investments to enhance natural areas. Living shorelines use natural materials and vegetation to reduce erosion and provide habitat. Traditional shoreline protection uses rock and man-made materials that often fail, are unattractive and do not support wildlife. By mixing traditional materials with native plants, biodegradable matting and wood, attractive, stable shorelines can be created that protect wetlands and host numerous animal species. Learn how the living shoreline at Leesylvania State Park was designed and functions, and observe the many benefits it provides to local communities and the Chesapeake Bay. Join us as we search for butterflies! Learn how to identify butterflies and habitat diversity, meet new friends, and explore the great outdoors. Following many years of service to Prince William citizens, Solid Waste Division Chief Tom Smith will soon retire. Tom leaves a legacy of improvements that have advanced the environmental sustainability of our landfill. Thanks to his steady march forward, the County has established recycling, active yard waste composting, and methane gas programs, to name a few. Learn more about Tom's achievements at our Open House. Please join us for a drinks, appetizers, and a toast to Tom Smith! Our Open House is free of charge, everyone is welcome. For more information, contact us at alliance@pwconserve.org or 703-499-4954. Where: Please RSVP to alliance@ pwconserve.org for the meeting location. Join us as we search for butterflies, dragonflies and other important pollinators. Help us learn more about wildlife diversity, habitats at Merrimac Farm, meet new friends, and explore the great outdoors. This is a regularly scheduled survey that occurs every other Thursday through mid September. Thanks to volunteer support, we created an area at Merrimac Farm WMA where people and the environment can come together as one. It's a great area to watch wildlife, learn about native plants and pollinators, and get ideas for your own backyard. We need help to keep nonnative invasive plants in check to maintain high quality habitat. Even if you can come just once, your help makes a big difference. Wear long pants, sturdy shoes, and long socks. Questions and RSVP (appreciated) to alliance@ pwconserve.org or 703-499-4954. RSVP Required to alliance@ pwconserve.org, 703.499.4954. You'll receive the meeting location for your survey team. Help us count butterflies for the Annual 4th of July Butterfly Count and learn more about butterfly populations close to home. This count is part of a nationwide program led by the North American Butterfly Association (NABA), which compiles information about butterfly populations and distribution that's used to study the effects of climate and habitat change on North American butterflies. “Every single day there are fewer butterflies in the United States than there were the day before. You don’t have to be a genius to figure it out,” said geneticist and NABA president Jeffrey Glassberg. Here in Prince William on July 29, we'll form teams and see how many butterflies we can find within our 113,000 acre count circle (centered on Manassas Airport). To view our survey area on Google Earth, use the coordinates 38.724270, -77.500466 as the center point for a circle with a 7.5 mile radius. We submit our compiled results to NABA's national database for butterflies. Everyone is welcome. 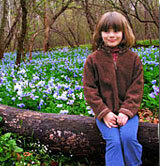 We are also seeking tips on specific areas to survey, notably areas with flowers. Please email us if you have ideas. A workshop for homeowners, civic groups, realtors and others interested in planning for a bright future. Please join us to welcome spring, celebrate nature close to home and meet local organizations and people who are working to improve our community. With some of the best Northern Virginia naturalists leading tours and activities, we're looking forward to a special day at an outstanding natural area. Click HERE to view the tour schedule and topics. Free of charge and family friendly! Questions? Contact us at alliance@ pwconserve.org or 703-499-4954. Guest Speaker Alonso Abugattas, the Capital Naturalist, is a locally known naturalist, environmental educator, speaker, and storyteller. He is Co-Chair of the National Association for Interpretation Region 2, co-founder of the Washington Area Butterfly Club and Natural Resources Manager for Arlington County Parks. Eat, drink and think green! Suggested minimum donation$50/ea. Please RSVP by March 8. Special Speaker Marc Aveni, Chief of Prince William's Environmental Services division, will share information about updates to stormwater rules and the Chesapeake Bay. Please join us for a drink, appetizers, and a lively conversation about stormwater from our backyards to the Chesapeake Bay! Our Open House is free of charge, everyone is welcome. For more information, contact us at alliance@pwconserve.org or 703-499-4954. Registration recommended. For questions and to RSVP call 703-792-7747 or email master_gardener @pwcgov.org. Creating a greener yard and garden does not have to involve making life-altering changes. 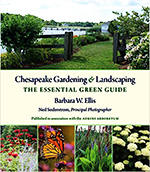 In this talk, Ms. Ellis will discuss a range of options—from simple steps to ambitious projects—that gardeners and homeowners can take to create beautiful, more sustainable gardens and landscapes that are attractive and healthy for humans, wildlife, pets, and the environment as a whole—including the Chesapeake Bay and all its tributaries. This event is free of charge, and refreshments will be served. Copies of the book will be available for sale and Ms. Ellis will sign copies after her presentation. Originally proposed to replace part of Chinn Parkland, this school is now slated for a site adjacent to Chinn Park, along PW Parkway between Kenwood Drive and Trowbridge Drive. While this new site is preferable, concerns about impacts to Chinn Park and the surrounding community remain. Questions? Attend our February 7 community meeting to find out more and learn how you can help protect parkland in PWC. When: Saturday, February 4, 10am to noon. Join PWCA for an easy hike through Prince William County's newest forested parkland. Dove's Landing is a 235-acre undeveloped property with one mile of frontage along the Occoquan River, upstream from Lake Jackson. The gently sloping landscape, open forest and scenic appearance are invitating and make Dove's Landing a great choice for a family outing. The rocks at the top of Thoroughfare Gap were once an ocean beach. The core of the Blue Ridge was buried as much as five miles underground. Dinosaurs walked on the reddish rocks that lie underneath Haymarket. The dark rocks exposed at The Plains were hot volcanic lava. 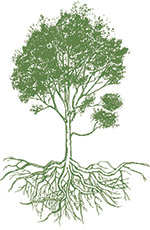 Join us to learn the stories about what's below our feet and above our heads! Sponsored by Bull Run Mountain Conservancy. Start the year off on the right foot! Join Charlie Grymes for an afternoon hike at the 400+ acre Conway Robinson forest, managed by the Virginia Dept.of Forestry. Questions? Contact us at alliance@ pwconserve.org or 703.499.4954. RSVP not required. Special guests include Occoquan District Supervisor Ruth Anderson, Sycamore Ridge Homeowners Assoc. President Rob Carswell, and Prince William County School's David Beavers. Please join us for a drink, appetizers, and a lively conversation about the public school proposed by Chinn Park and the preservation of green open space in Prince William County. Contact us at alliance@ pwconserve.org, 703.499.4954 to register and join a survey team, and receive meet up location. Now in it's 117th year, the Christmas Bird Count, led by the National Audubon Society, provides scientists with information on the status of bird populations across North America. Birding enthusiasts are invited to join the Nokesville Christmas Bird Count (CBC), sponsored by Prince William Conservation Alliance. All CBC Circles cover a 15-mile diameter circle (113,000 acres). The Nokesville count circle, centered at Merrimac Farm WMA, covers a diverse landscape at the edge of the Baltimore-Washington metropolitan area and captures the transition from coastal plain to piedmont ecosystems. Our survey area includes portions of Prince William Forest Park, Merrimac Farm WMA, several wetland banks, and large areas within MCB Quantico. Please join us for a fun, rewarding day and be a part of the oldest and largest citizen science project in the Nation. Read more about the Nokesville CBC here! Prince William Conservation Alliance is a nonprofit watershed organization serving Prince William and surrounding communities. We're working to explore, enjoy and protect our natural areas, and increase community involvement in stewardship opportunities. Most of our programs are free of change thanks to the generous support from people like you! Click here to read more about us. Click here to donate and support local opportunities!